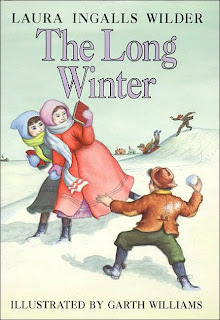 The winter of 1880-1881 in South Dakota was harsh, beginning with a blizzard in October. By December, railroads were blocked, preventing trains from bringing supplies until spring. The Ingalls family had to make do with what they had, and their supplies quickly dwindled. When they ran out of flour, they started grinding wheat in a coffee mill in order to make bread; when the coal was gone, they began twisting hay into tightly-formed sticks to burn. They went to bed early because they had so little kerosene left, and all their waking hours were spent taking turns grinding wheat and twisting hay. The only reason the Ingalls family and the other inhabitants of De Smet managed to make it through the winter was that Almanzo Wilder (Laura’s future husband!) and his friend Cap Garland braved the weather to search for someone they heard may have grown wheat the previous summer. They found him, negotiated with him, and managed to bring back enough wheat to keep everyone from starving before spring. If you ever feel a need to read something that puts things in perspective for you, this is a pretty good one. The family was close to starving and managed to still sing and laugh and appreciate what little they had – granted, it was more difficult than usual but they kept it up, knowing they just had to hold on until spring when everything would be better. It sounds bleak, but it was still a pleasure to read. The family’s resilience and hope for the future was inspiring. Almanzo was apparently very fit, and therefore survived!